Dental implants have been in use for over 40 years. During that time, they have proven to be strong and enduring additions to the dental arsenal with a high rate of success, giving a desirable alternative to replacing missing teeth with dentures or bridges. 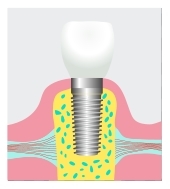 A dental implant is an artificial replacement for a missing tooth root. Once it has been placed and fused with the bone (a process called osseointegration), an abutment and crown can be attached to it to create a false tooth that looks and performs as a natural one. Your dentist will evaluate you and let you know if you are a good candidate for dental implants. Providing you have adequate bone mass, you are likely able to support an implant. An x-ray and CT scan are required to make a decision as to whether or not an implant can be placed, and will help decide what type and size of implant you will need. 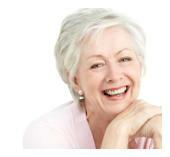 Dental implants are an excellent alternative to fixed bridges and removable dentures. They offer a more realistic and natural look, placed into the gum to support a crown the same way a natural tooth is supported. There is less bone loss, giving stability to the area and protecting surrounding teeth from becoming loose. Dental implants can also be used to hold dentures in place. Implants offer far greater retention and stability to patients with dentures, and can be either snapped into place or screwed on to be permanently attached. Lastly, implants preserve more of the natural tooth structure than a bridge, which was once the preferred method for replacing a single lost tooth. To anchor the bridge in place, crowns must be affixed to the adjacent teeth, requiring the destruction of healthy tooth structures and negatively impacting the health of your teeth. An implant is an independent structure and will not negatively affect surrounding teeth. Looking for a great implant dentist in Tustin? For more information please call our office to schedule your consultation.